Peter Leeson is no stranger to explorations and explanations of bizarre behavior, nor to making the power of rational choice theory and economic thinking accessible to laypeople. His academic papers on odd rituals and his books like The Invisible Hook do a bang-up job of both. But WTF?! 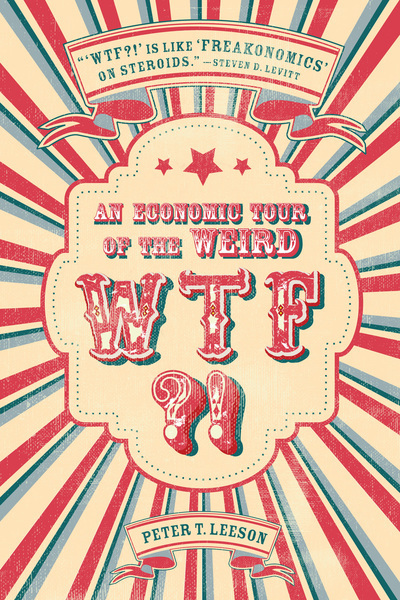 : An Economic Tour of the Weird, is something else altogether. As far as content, the book combines eight real world behaviors that make you say “WTF? !”, derived from Leeson’s research and published papers. Everything from shaking a poisoned chicken to settle a slight, to convicting insects and rodents of crimes in a court of law are examined, revealing sensible, even brilliant logic. The theme over and again is simple but profound: given the constraints (beliefs, resources, etc.) they face, people behave in rational ways to seek their ends. Yes, trial by combat and wife sales are rational actions in context. But what makes the content in WTF?! really stand out is the form. Leeson’s academic work is accessible, but this book is downright fun. It’s like Ripley’s Believe it Or Not; enjoyable as much for entertainment as enlightenment. Acting as a tour guide, Leeson describes strange phenomena and their rationale, while engaging colorful characters on the tour who ask many of the questions readers are thinking. The guide pokes fun at them, and himself, shares barbs and insults, and connects to stories from his own childhood. You don’t need to care one bit about economics or social theory to enjoy this book. Conversely, if you hate fun and frivolity and care only for social science, you’ll find serious economic theory in WTF?! If you don’t find the world more fascinating and enjoyable, and people more ingenious and clever, after reading WTF? !, something might be wrong with you!